U.S. vs. European Manufacturing Drawings | Vista Industrial Products, Inc. Being in the manufacturing industry since the 50s, we have fabricated metal products for companies throughout the world. Although most of our business comes from the US, we often see customers with European drawings. Although the drawings depict parts that allow for ease of manufacturing, the orientation and projection of the part views are a different standard that what we use in the US. This article will discuss how they are different and why. Before we get started, lets take a step back in time to the World War I days when there was a major lack of engineering and drafting standardization around the world. Engineers and machinists had no regard to the placement and views of a part and only included what worked for them personally. During the war, both the US and Europe fabricated parts and had to provide more detailed drawings and were forced to exchange methods of drafting. Although more details on the drawings were becoming defined, the view placements never standardized. In Europe, they had adopted the First Angle Projection (ISO standard) long before the war and it became their standard, which was based upon the style of Monge’s descriptive geometry . 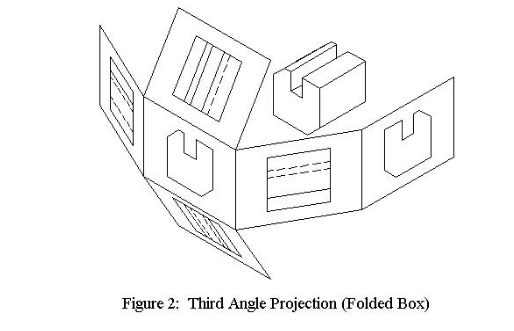 “Monge’s method of projection required creating lines of projection from one view to the next in similar fashion to that of the third angle method, with the exception that the projection lines must cross the object from which they originate before being represented on the projection plane” . The views were depicted as if you were looking at an X-ray of an object: “the top view is under the front view, the right view is at the left of the front view” (Mahmood, 2009). Another way to describe this method is if you had an object standing upright on your desk, and you pushed it over to the right (top down) that would be the view of the left side of the part. Although this method was the standard to use in Europe for quite some time, it’s difficult and cumbersome to follow with complex parts. Courtesy of the Technology Interface Journal. 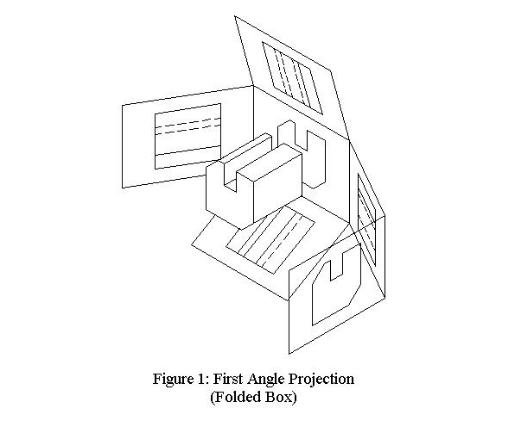 Due to the complexity of the European standard, the US adopted a different method of depicting an object’s views on a manufacturing drawing that was much more logical and easier to use for complex parts, and that was the Third Angle Projection. The US began using this method in part due to the “educators of the time whose jobs were to train draftsmen in the methods of graphic representation. As early as 1816, text on descriptive geometry had made their way to America” . This method uses the left view on the left and the top view is on the top, which makes it much easier to visualize an object, simple or complex. Another way to describe this method is if an object was in a glass cube. By turning the cube on its sides, those would the the corresponding views. If you have the object upright and then turn it right, it would be its right side. Even after the first and second world wars, both the US and European engineers knew they needed to standardize the drafting method, but neither came to a consensus and so both use their preferred methods til this day. However, in modern day with the use of CAD, engineers are able to easily use software to manipulate an object’s views and can alter it to first or third angle, or any projection view for that matter. Melton, David, W. and Stewardson, Gary. (Fall, 2008). “The American Drafter: Why Use 1st Angle Projection in a 3rd Angle World?” The Technology Interface Journal/ Fall 2008. Retrieved from: http://technologyinterface.nmsu.edu/Fall08/10_Melto/index.pdf. Mahmood, Bhuiyan Shameem. (March 8, 2009). Engineering Drawing. Retrieved from: http://www.slideshare.net/shameem.mist/engineering-drawing. This entry was posted in Drawings, Engineering, Principles, Principles and tagged blueprints, drawings, first angle projection, prints, third angle projection by Britney Blue (Payne). Bookmark the permalink. Pingback: Manufacturing Prints – View Types | Vista Industrial Products, Inc. Thank you so much for bringing clarity to an obscured concept or method for me. Very well done and informative. I am currently studying at I.M.H. in Gizpuzkoa Spain and am used to Amaerican concepts. Again thank you.